The Mixed Marvel Arts Podcast awards their favorite 2017 Marvel entertainment with the ultimate slice of cake! Brian and Shaun vote on their Mixed Marvel Awards nominees to determine some of Marvel’s best stories, creators and characters from the previous year. The hosts call upon their social media friends and members of the Fantasy Comic League to help sway the results. 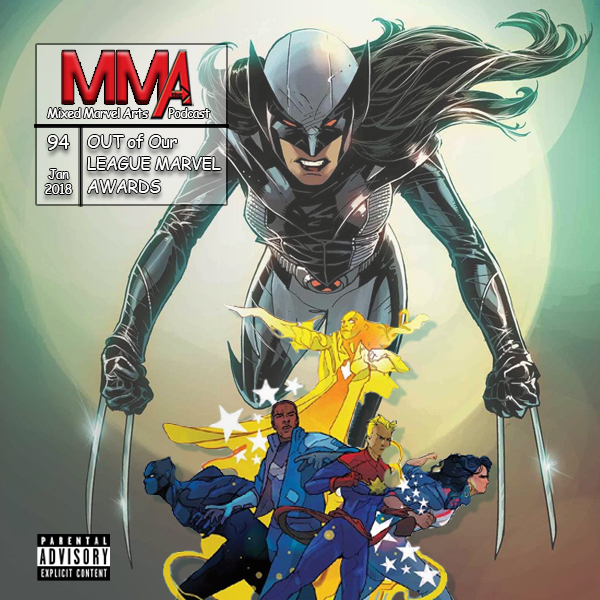 Big winners include Laura Kinney, the All-New Wolverine, who carved out a name for herself in 2017, and the Ultimates, whose book pleased a number of fans including Shaun. Before the winners are determined, Brian rattles off the top performances by Marvel heroes drafted in the Fantasy Comic League. Wolverine is well represented in the League, but nothing was going to stop Peter Parker, the Amazing Spider-Man, from retaining his position as Marvel’s most popular character. Episode artwork: Cover artwork for All-New Wolverine, vol. 1 #19 by Adam Kubert and Frank Martin; cover artwork for Ultimates 2, vol. 2 #9 by Christian Ward.